One of the greatest days ever on a bike. 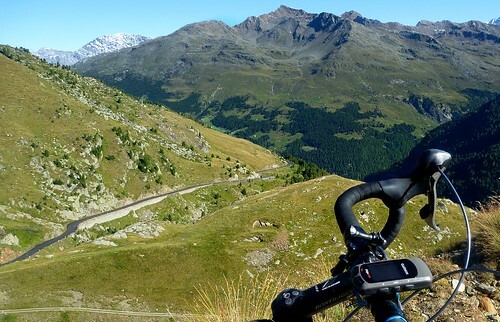 I’ve dreamed of doing Gavia forever, one of the most famous climbs in Italy (and Europe) – and it didn’t disappoint. It’s cold here. Really cold. So I wore booties, leggings, full-fingered gloves, warm hat, sleeves, etc. And carried balaclava, glove liners, jackets, etc. Yep, I over-dressed again – but barely. I started up the Bormio side before 9 am, and it took me a while to get warmed up – cold but sunny and clear – perfect day. Luckily the easiest climbing of the day is the first part of this side. It’s a lovely ride, so quiet and beautiful that I laughed out loud a couple of times. 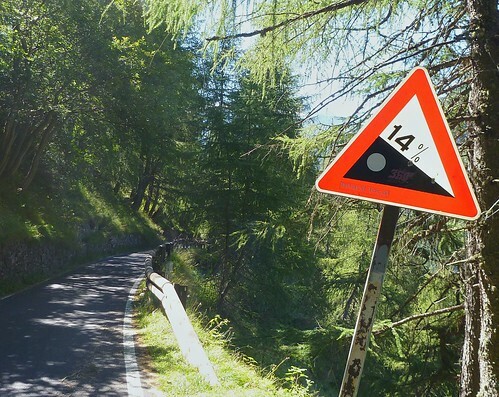 A climb of three parts: flat to start, then steeper with hairpins through the woods, finally above the tree line — in the high mountains – awesome. Near top is a great WW1 memorial (I deciphered the Roman Numerals, ha!) – my Italian is non-existant – perhaps a battle here? It was freezing at the top, and I congratulated myself as I put on 2 jackets and a couple of Dutch guys in shorts looked on longingly. The descent of the south side is a little crazy. Steep, narrow, beautiful, occasionally badly surfaced. A few % grade signs including a 16% and a 14%. The tunnel 3 kms from top is truly terrifying. Dark, steep, gravelly, scary – I held my breath when a car passed me. I wasn’t looking forward to climbing it (see below for my elegant solution). 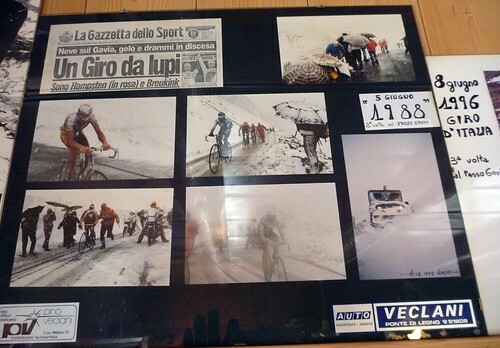 The south side is legendary, the site of several snow filled Giro stages – the restaurant at the top has a great set of pics of various Giro visits (photo at left). 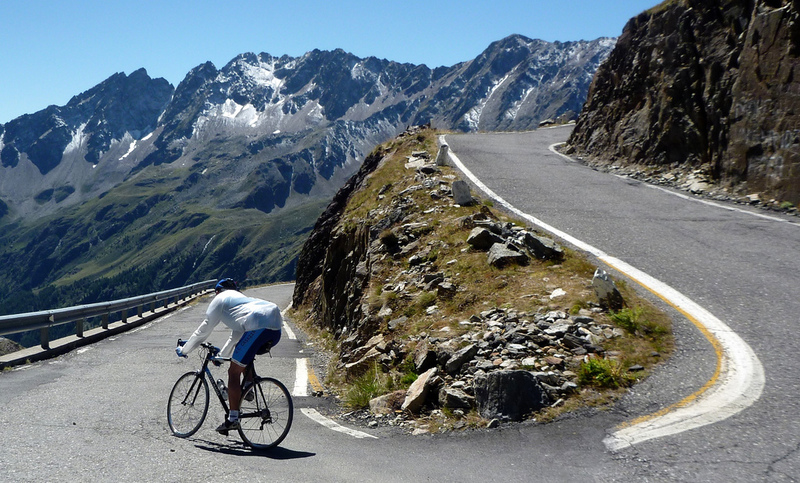 I took my time climbing it – but was pleased at how my legs responded on the narrow, fun(!?) 14% and 16% stretches. As I approached the much-feared tunnel, I noticed the old cliff road on the left. 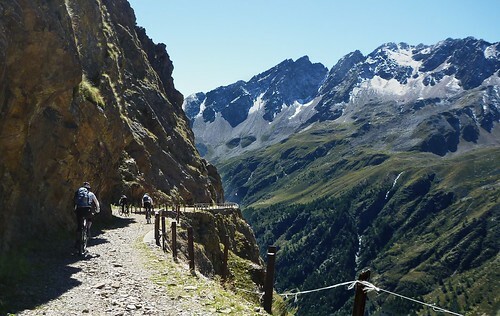 Collapsed cliff roads replaced by tunnels are a fairly common thing in the Alps, but they are usually fenced off. This looked open, so I explored. A terrible surface, so I pushed my bike. But unbelievable cliff views. As I continued I came upon several memorials for a military truck that fell off the road in 1954 killing 20 or so young soldiers. Above the tunnel, the last 2+ kms are steep, but superb. Hairpins, views, cliffs, etc. How can one not enjoy suffering here? One of the greatest days ever on a bike. 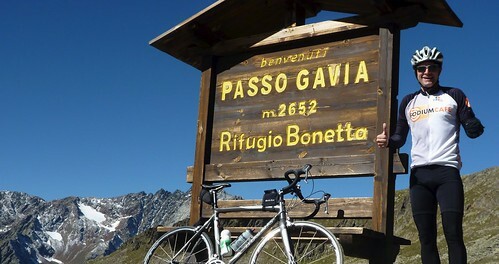 I've dreamed of doing Gavia forever, one of the most famous climbs in Italy (and Europe) - and it didn't disappoint. WOW!!! What a day you had — love that you achieved a dream, laughed out loud and had cold enough weather for all your clothes! Awesome!! Lovely pictures. What camera do you carry? I need a recommendation for something that will capture beautiful images when out cycling but that won’t weight me down. Gavin, currently using a panasonic dmc-ts1 (a ts2 is already available). It’s a decent quality portable that has 2 huge advantages: waterproof (huge when sweating or cycling in rain), and rugged (it withstands falls/bangs). hey will, fantastic! Thanks for the inspiration, i’ll have to try to make it over there some day (a warmer day, mind you). Hi Will. What a day you had… wish I’d been there. Gavia is beautiful 🙂 Thanks for some really cool pictures. Beau coin, bien joué ! Super le “Closed Passo Gavia stretch”. Great posting Will – out end of month. Ditched the 53/39 for a compact – ready to rumble! I’ve gone green again Will, just another one to add to my list of (way in the future) rides! I recently finished a cycling tour with friends (self-supported with 2 cars) thru the Dolomites and Alps. 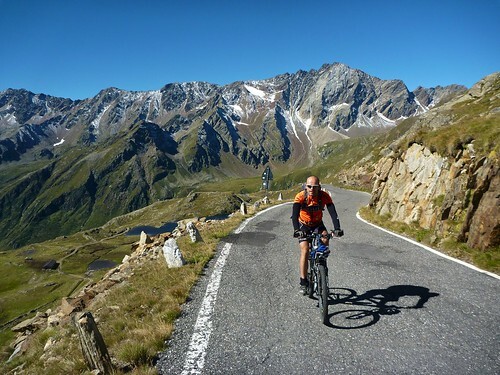 Our “Queen Stage” started from Ponte de Legno (actually a campsite further West, downstream), and started with Passo Gavia. Beauty climb and seemlingly much safer on a bike than the very narrow road during the climb. I was very happy to have the 39×27 on my road bike. We stopped at the top for a quick bite, then flew down the other side into Bormio. Five of us road the climb up Stelvio, which I found easier than Gavia (nice road surface!) and noted the reduced air volume for the final 3km to the top. Then three of us flew down the pass into Switzerland and finished our day going over the Offenpass, finishing at our campsite in Zernez. It was only about 130km, but the total ascent for the day was pretty intense! Thanks for this website and information! 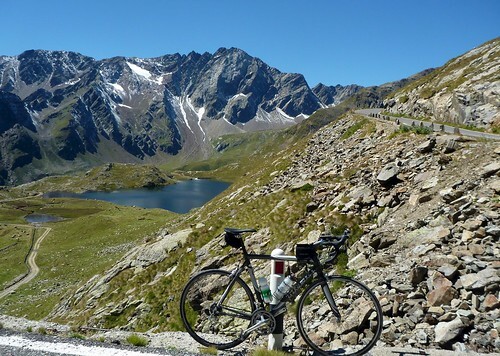 I used this several times before our trip, and loved bagging the cols along the way! We hit at least 12 Cols on route, plus a smaller one on the Ironman France course near Nice. LOVED cycling the Alps and Dolomites! Will definitely return for more from Canada! What a great climb this is. 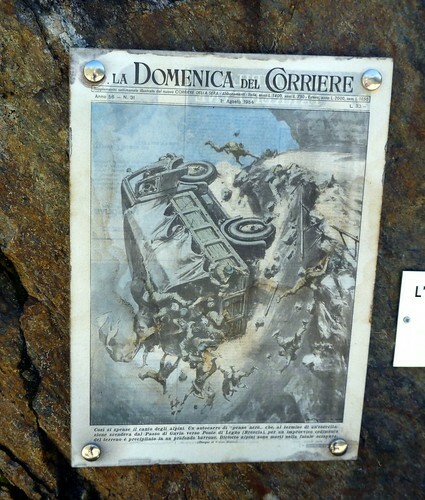 We incorporated it in a loop starting in Valdisotto, near Bormio. 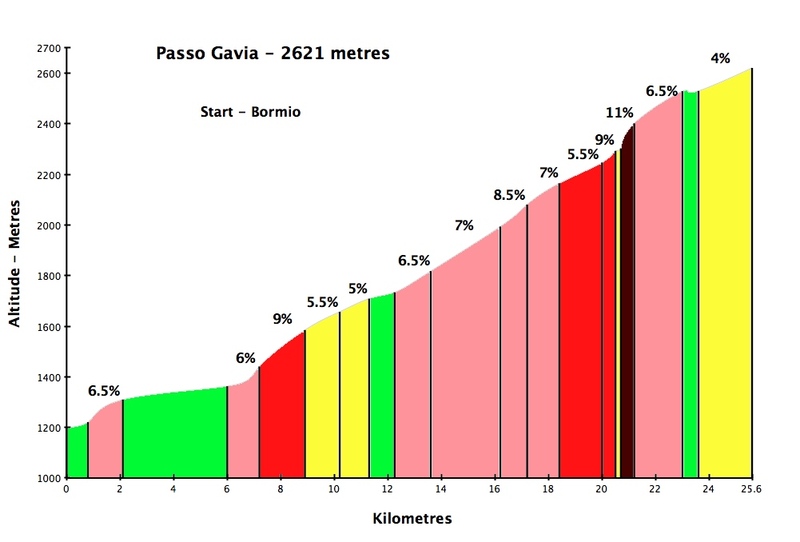 Climbing the Mortirolo from Grosio, descending to Monno & then onto the Gavia. 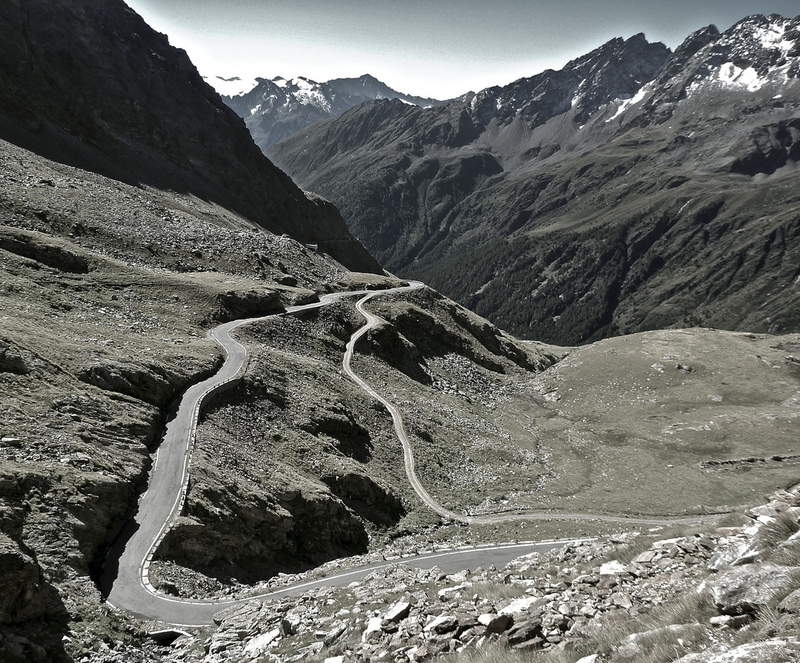 Ah… Was on the Gavia in June 2012. Monday it was FULL of snow and had to be ploughed clear. 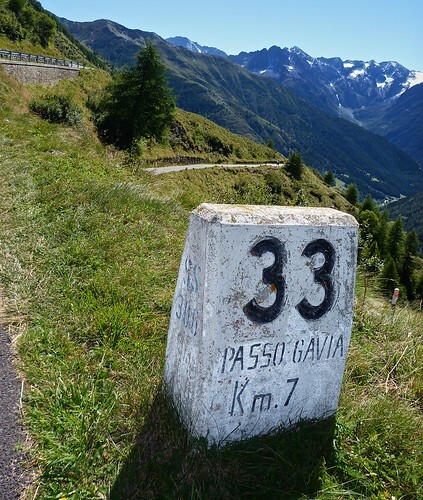 Tuesday in Bormio was 24C and I went up the Gavia. It was 5C at the top 😀 fortunately had just enough coins for large hot chocolate at refugio. Also got some great pictures of a group of Alpine ibex when only myself was around, and rolling swiftly back to Bormio managed to ride straight through the middle of a group of indignant, fat little marmots that were sunning themselves on the road surface before they could even scramble to their feet. But Hells bells!!! I had no idea the old bit of road round the edge of the tunnel in the south could still be negotiated! 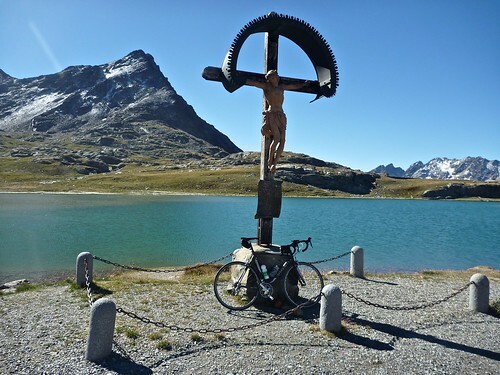 Time to go back there, one of our group is thinking ever harder about climbing the Gavia and Stelvio… Mind you could you get a road bike round it? Tim, It’s pretty much too rough to ride much on the road bike. I walked my road bike and enjoyed the place. 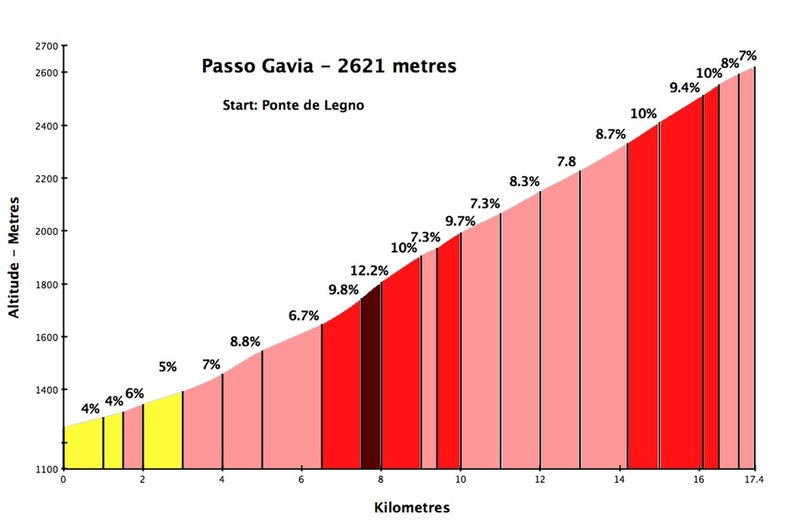 Gavia is the most beautiful ride of my life . If you only do one mountain this is the ONE . No picture does this justice you have to see it for yourself . Best done from tirano-mortirolo-ponte di legno . Sometimes if you are blessed you will see marmots and the majestic ibex in the final turns. Be warned that the Bormio side is freezing especially after sunset . 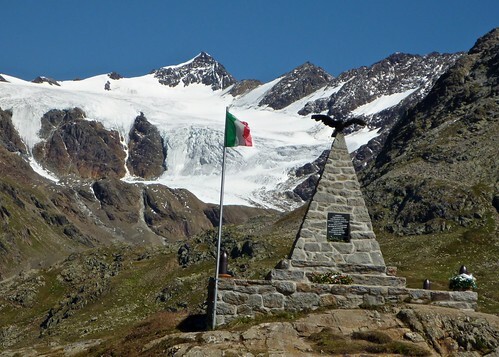 The war memorial (pyramid) is the Battle of San Matteo the highest battle ever in WW1 at over 3800 meters.There is a church across the road from this. The Bonetta Family run the rifugio at the pass -this is a good place to buy a jacket if you need . There are so many giro pics in here well worth the coffee stop . Thank you Will for this site. Some of us may never get to ride these beautiful places, but your work/play allows us too dream.